The perfect Piggy Bank! 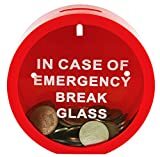 The Emergency Money Box is a great way to save money and makes for a funny but practical novelty gift. Perfect for your Christmas or Birthday Parties, White Elephant Gift, etc. Or just use as a fun way to save money. Perfect for kids or adults. Can use at home or at the office! While you could smash the glass to retrieve your money, the back cover is removable to remove your money from the bank. Bank is made from all Plastic.